Everyone jams when it comes to a Post Social concert. 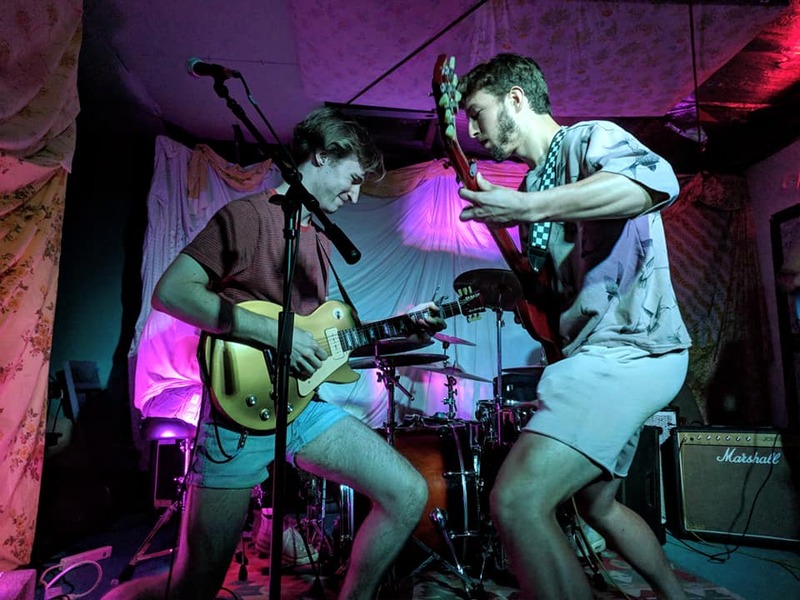 With their long-standing presence in the Madison music scene, the boys of Post Social have established themselves as the face of do it yourself music venues. 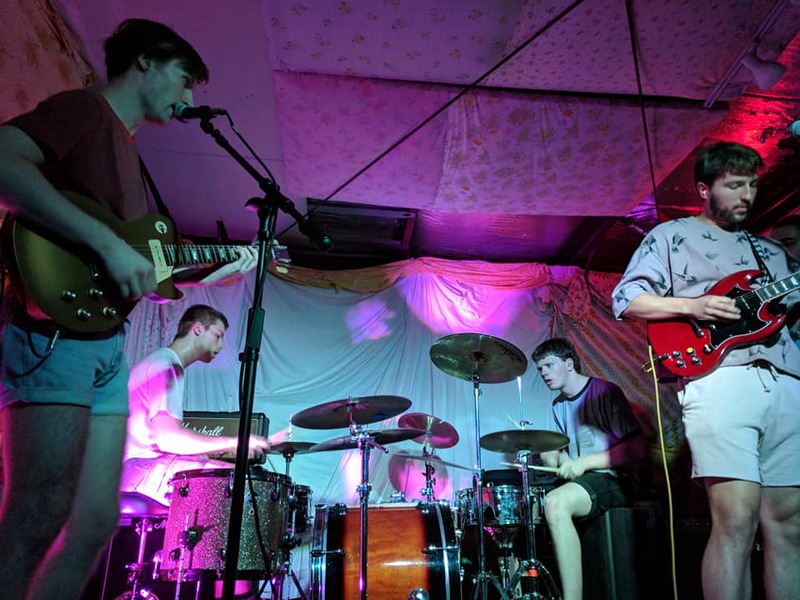 DIY venues are small-scale settings where artists can take a full creative reign without the interference of larger corporations. 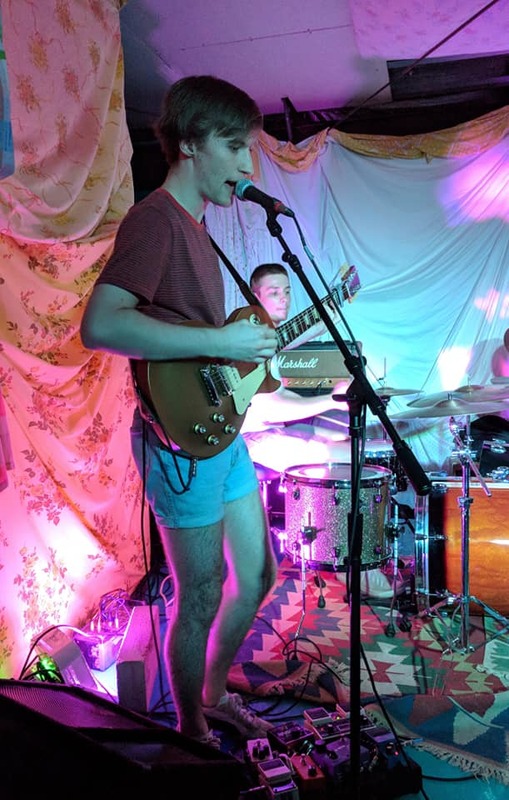 Vocalists and lead guitarists Shannon Connor and University of Wisconsin senior Mitch Dietz, as well as bass guitarist Sam Galligan and drummer Brendan Manley have conquered rising DIY music venues in Madison. 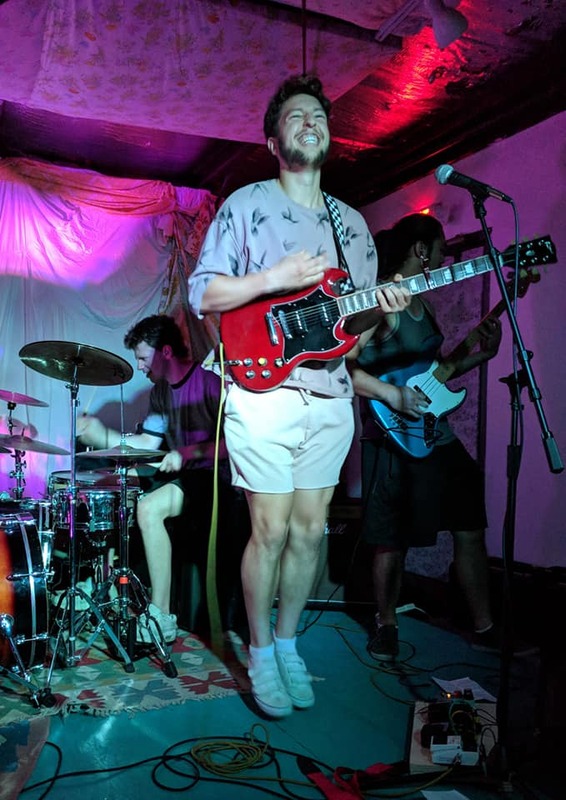 From Art In on East Washington Avenue to Communication just off Winnebago Street, the foursome have established a repertoire with local, small-scale venues. I met up with the group before their show in the parking lot of Communication, the venue wasn’t letting anyone in until they finished setting up an art exhibit. Allegedly, nothing out of the ordinary for one of the many DIY spots in the city. Drummer Brendan Manley enjoys a special guest performance by Isaac de Broux-Slone on the drums. Joined by special guest Isaac de Broux-Slone, who performed with Post Social during their set later that night, the six of us had a conversation about the future of the group. We also discussed where DIY venues fit within it all while being fervently chewed on by avid mosquitoes. Sitting in the back of Dietz’s van, I asked what DIY venues meant to the group. 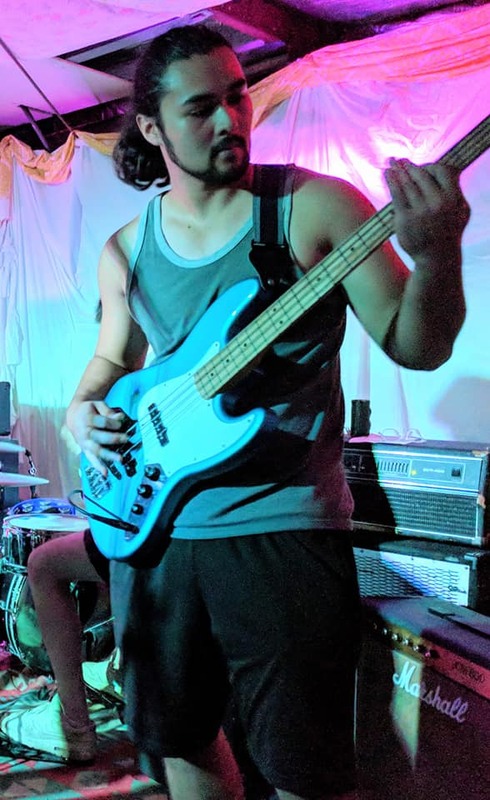 Sam Galligan stays smooth on the bass guitar for Post Social. When it comes to bread and butter venues, artists know they can be trusted. These places allow groups like Post Social to play shows at any given time. The group often performed at The Frequency prior to its closing. Now there aren’t many places left that are considered mid-level venues. Communication and Art In are considered the places to be if you’re not a touring band or on a label. Although admitting the group isn’t very ambitious, Connor said he’s disturbed by the current corporate nature of the Madison music scene. Dietz agreed, citing the flaws larger names in the city create for lesser-known groups. 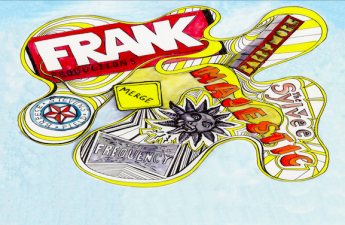 Multinational corporations like Live Nation, who purchased major interest of Frank Productions have been detrimental for small time bands. Live Nation Madison is now allowed to acquire booking rights for the High Noon Saloon, Majest Theatre, the Orpheum and the Sylvee, Madison’s newest performance spot. The minds behind the riffs, Shannon Connor and Mitch Dietz treat the Communication crowd to dueling guitars. 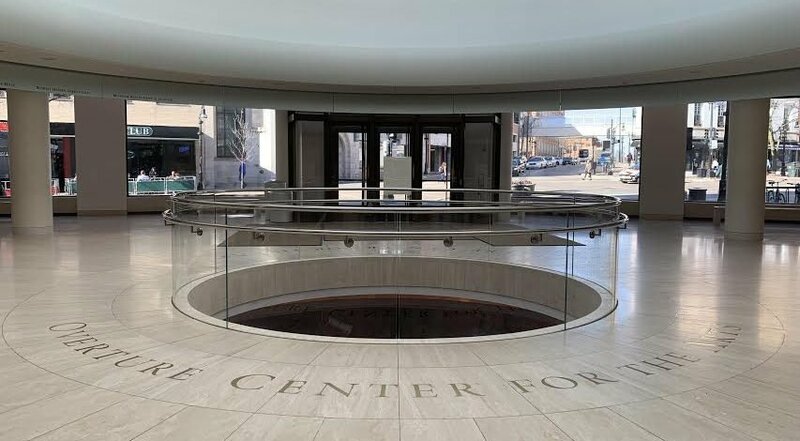 Despite what seems like a takeover of Madison’s music scene, with bread and butter venues like Communication, Post Social can continue to explore the genres they play. Their latest record, Major Congrats, bounces around alternative, indie and rock with a somewhat sarcastic title. A funny quip with no overt message, the record mainly portrays how the guys talk to each other. Though not sarcastic people, getting the joke of the album requires sharing a mindset. The first couple minutes of the lead track “Outside Man” comes to your ears with nothing but madness. All of Post Social jamming as if they had already played a 20-song headliner was a satisfying feeling — once it was actually recorded. The group was recording the song live at the same time in the studio, so if one messed up, there had to be a new take. It was the first song the group recorded for the album, which came with added pressure. “It’s an easy song to play, yet when you have to play for six minutes straight and do it five times, eventually you just stop giving that live energy,” Galligan said. Connor performed while working to ignore mosquito bites from earlier in the evening. Although recording the first song may be the hardest, it took less than 10 attempts to get the recorded audio 100 percent right. Gilligan claimed he had no faults during the first few attempts, before eventually admitting fatigue and being the source of several mistakes. The songwriting process is very collaborative with Post Social. All four at some point or another do most of the songwriting on a given track, though Connor and Dietz are responsible for most of the riffs. Dietz gives an animated performance at east side DIY venue Communication. 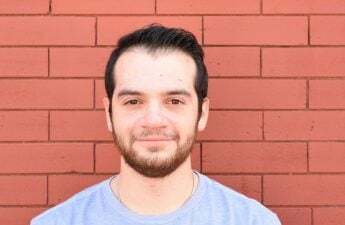 One song grew on their friend Morgan Winston, who directed and starred in Post Social’s one and only visual with “Better Off Dead.” The group agreed Winston was a great director who got the job done on time while having it turn out exactly as imagined. 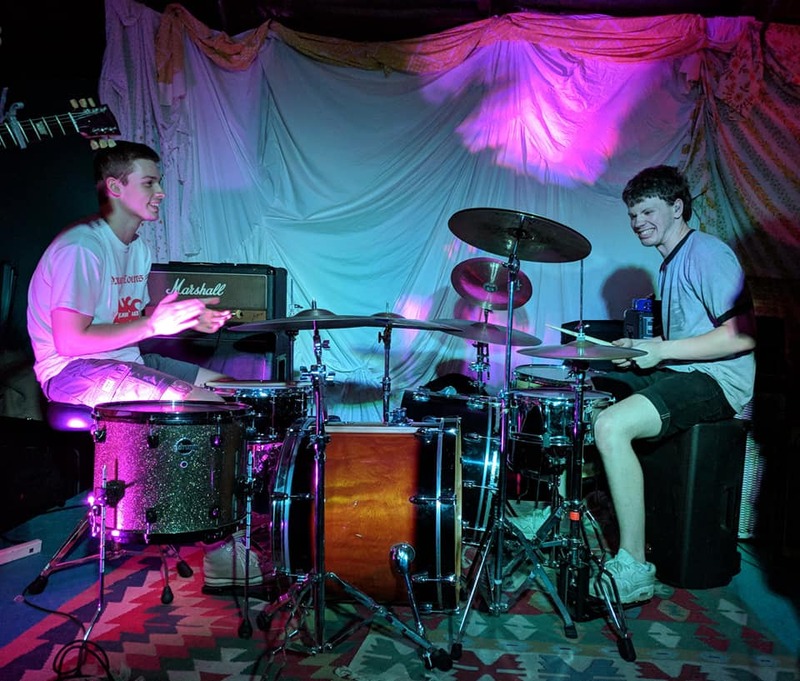 During filming, what made everyone in the band uncomfortable was a scene where Connor, Dietz, Galligan and Manley all played their respective instruments in the face of Winston. The group stood mere inches away from Winston, staring through cigarette smoke. Inhaling the nicotine was something Dietz said he could’ve lived without. The four Madison boys have produced an album every year before letting Casablanca breathe after its 2016 release. Dietz said Post Social’s priority is almost always recording and getting new music released — at least that’s how it’s been for a while. With as large discography as they do, it’s surprising Post Social has a nonexistent touring schedule. The group is seeking to perform outside of the Isthmus, targeting moves after December when Dietz graduates from UW.